After the scare of salmonella and e.coli in raw eggs, I am very skeptical about using them in the uncooked form. So I really do not make cheesecake with raw eggs. I love the way some food brands include a recipe on their packaging. Years ago I found the recipe of a cold uncooked cheesecake on a ‘zesta’ jelly (jello) packet. Decided to try it out. One of the ingredients required was cream cheese and when they printed that recipe on the box, they probably didn’t realise that cream cheese was not available in Kenya. So I substituted it with curd cheese and the end result was fantastic. 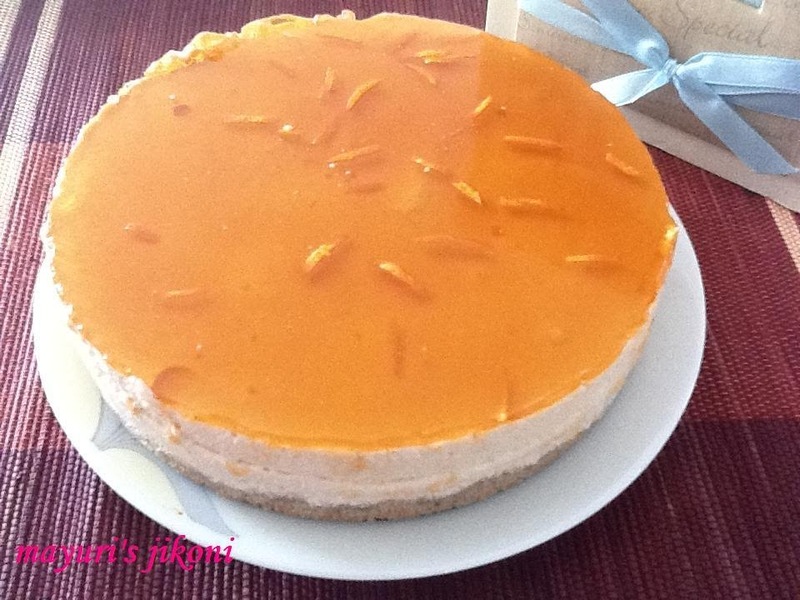 Since then, this recipe of cheesecake has been popular for dinner parties, birthdays, as a dessert etc. I have used cream cheese instead of curd cheese in UK and the result is equally good. I tried using the local vegetarian jelly in India for this recipe but it didn’t work as the veg jelly available in India does not set well. If you don’t mind using the normal jelly, then the end result is good. Though I couldn’t whip the amul cream to a fluffy consistency, I just whisked the curd cheese, cream and jelly together to get a light airy mixture and it did set well. As a rough guidance, I have written 85g of jelly but can use the 100g one. Just make the jelly using the amount of water I have written in the recipe. Crush the biscuits in a food processor or by putting them in a ziploc bag and crushing with a rolling pin. I prefer a coarse texture. Melt the butter and add it to the crumbs. Mix it well. Spoon the crumb mixture into the tin, spread it out evenly and gently press it down. Put the tin in the fridge for the base to set. Set 2 tbsps of the jelly crystals aside if you want to use it for the topping. If not, then add all the jelly crystals to the hot water. Mix it till the crystals dissolve. Let the liquid cool down. Whisk the curd cheese till you get smooth consistency. Add the cold jelly liquid. Blend it well. Beat the cold fresh cream in a separate bowl till it is fluffy. Add it to the curd cheese mixture. Add the orange segments and 1 tsp of the finely chopped orange peel. Gently mix everything. Pour the curd cheese mixture gently over the base. Using a spoon or spatula, level it out. Let it set in the fridge. This will take about 6 to 8 hours. Heat ¼ cup of water. Dissolve the 2 tbsps of jelly in it. When the liquid becomes cold, pour over the set cheesecake using a tablespoon. Scatter the remaining chopped peel over it. Put the cheesecake back in the fridge for the topping to set. This takes about 30 minutes. Remove the cheesecake from the tin and place it on a serving plate. Slice it up and serve. Make sure the cream is cold. If you whip warm cream, it will begin to separate. You will need about 2 litres of milk to get 225g of curd cheese. To make your own yogurt at home. Heat the milk till it comes to a boil. Take it off the heat and let it cool till its just warm. Add a teaspoon of yogurt to it. Mix and let it sit in a warm place till it sets. To get curd cheese, place about 1½-2 litres of yogurt in a clean muslin or cotton cloth. Gently squeeze it so the water comes out. Take a colander or plastic basket. Place a thick wad of newspaper in it. Place the cloth full of yogurt on the newspaper. Place another thick wad of newspaper over it. Place something heavy over the paper like a brick, stone or a pressure cooker. Let the water drain out from the yogurt for about 30 to 45 minutes. Curd cheese is ready for use. Use cream cheese instead of curd cheese if it is available. If you don’t want to use jelly as a topping, decorate it with orange or tangerine segments or grated chocolate or fresh whipped cream. Substitute orange for any flavour of your choice.